Inspiring People and Businesses with Charity. Hello and Welcome to Amiga Debbie's Page. Thank you for visiting my page. My goal is to inspire you, your friends, families, and our community to help the homeless in our cities. If you are not from Seattle, I hope to inspire you to help the homeless folks in your city, your town, or your country. 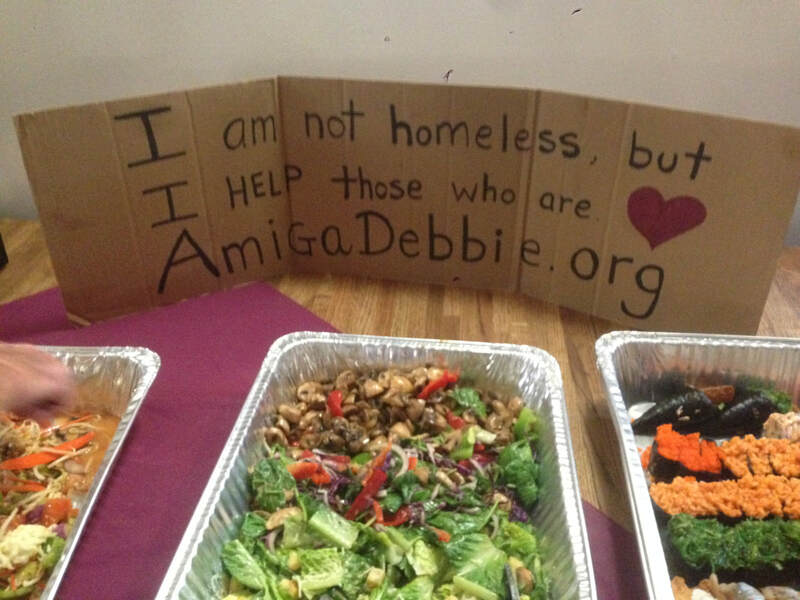 If you have received a business card from me or you have seen my cardboard saying "I'm not homeless, but I help those who are <3 AmigaDebbie.org", or "Be Inspired... AmigaDebbie.org" I am glad you are here visiting my page. Please come back from time to time to see what's new and what I have been doing to help those in my community. I hope to hear from you and/or see you again someday in volunteering, networking, or dropping off donations for the homeless I support. I am made in Hong Kong, exported to Perú, and imported to the United States. Proud to be an American citizen helping those who appreciate our time and caring hearts. It takes one and all of us to step up and make a difference in someone's life no matter how small the act of kindness is. Our support to the homeless and families in need could make a small difference or could make a huge difference in their lives. Please be advised that I am not affiliated with any individual or any organizations listed on my AmigaDebbie.org page or Amiga Debbie Friends Facebook page. No one has my authorization to contact you or your business to solicit any monetary donations or any type of donations on my behalf. I am not a non-profit organization, a social worker, or a business. I am blessed to have a great community of folks donating their time as volunteers, donating food and drinks to help those in need. I inspire folks and they inspire me to help the homeless, I support individuals and some non-profit organizations who help the homeless and low income families. From my own saving funds, money I raised through business with charity, and donations from friends, neighbors, and several communities who support my passion, I am able to provide food and much needed items such as sleeping bags, backpacks, tents, flashlights, lanterns, batteries, clothing, underwear, shoes, socks, toiletries, etc. to many homeless folks and low income families in need. During the cold winter months, I bring blankets, warm clothing, shoes, socks, toiletries, etc. During the hot summer days, I bring summer wear, ice-cream, freeze water bottles, and distribute them to the homeless folks. The best way to support the homeless is by volunteering your time and by giving donations directly to them. I'd like to invite you to visit my gallery of pictures to see how much happiness we can all bring to so many folks. Also, check out https://www.meetup.com/SeattleVolunteers/photos/ link to see what I have been doing to help the homeless and other non-profit organization since November 2009. I raise awareness, inspiring folks to volunteer and support the homeless in our community and their community. I also host events to raise money to buy extra items that normally are not donated regularly for the homeless. Such items (new underwear, propane, flashlights, batteries, and tarps). Connecting businesses with charity in mind. From May 2018 to the present, I am supporting a group of folks who are serving food for the homeless in the Seattle area by bringing food and donations to various locations in the Seattle & Everett once a month for 5 to 6 hours. I am a volunteer and supporter of the Monroe Community Senior Center since April 2019. Helping in the kitchen and asking local businesses for donations and distributing procurement forms for their annual dinner auction. For more info, visit mcsc.org and support them by volunteering or making a donation. Your support helps to run their facility year round. I am collecting all sizes of underwear for men/women, backpacks, sports bags, sleeping bags, any type of bags (garbage, zip lock, or canvas), batteries (AA and AAA), 16 oz propane for tent heaters, tent heaters, and fleece blankets for the homeless living in the streets of Seattle. From January to March 2019, you can drop off winter items at Emeralds One Hour Cleaners at 12012 NE 85th St. Kirkland, WA Opens Mon to Sat 7am to 7pm. ​Nov. 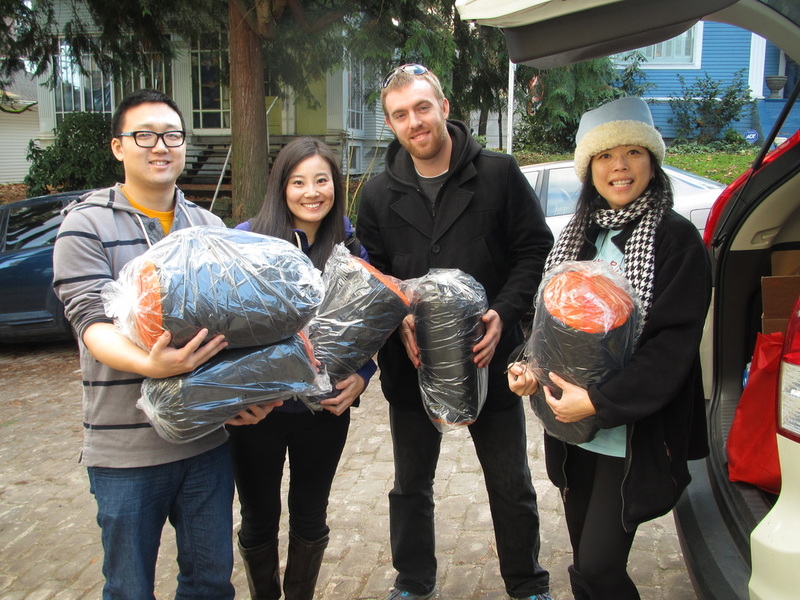 2, 2019: Volunteered with Sleepless in Seattle to distribute sleeping bags and socks to the homeless. Just in time for our snowmageddon that is currently happening. I volunteered with Birthday dreams by delivering a birthday package to a child/children to help celebrate their special day. Also, volunteering and supporting Turkcha, a women charity and aid organization. This organization supports homeless women in the Seattle area with a monthly meal and donations. Also, dropped of winter items (scarves, gloves, and hats) to the women at the YWCA in Lynnwood thanks to Value Village in Totem Lake for the wonderful donation. ​On September 22, 2018, Volunteered one evening with the Fremont Arts Council during the Luminata event in Green Lake. 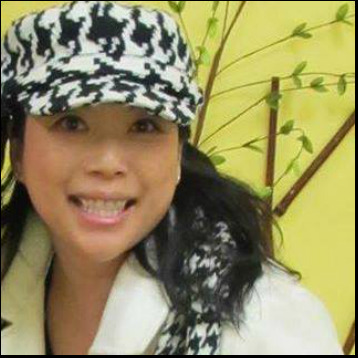 Between November 2009 through December 2017, I have been a volunteer and hostess with AOK Friends (Acts of Kindness) Friends by preparing food, bringing donations, raising and donating money for the organization. I have also dropped off donations, food, water, soft drinks, ice-cream, and candy for the homeless standing outside the Union Gospel Mission. Secured a mini van for their food transportation (Thanks to Jack L for this generous donation). Dropped off donations for the homeless supported by Facing Homelessness. Volunteered with Kay Abe and her church group "The Lords Table" on weeknights in 2015. Between March 3, 2018 to May 2018, I visited a new homeless encampment called Camp Second Chance bringing food and donations to their residents. In December 2018, I dropped off many painting donated by The Paint Palace for the residents to decorate their tiny homes. From Dec. 30, 2017 to Jan. 2018, I brought rescued food, clothing, shoes, blankets, and toiletries to the homeless in Wallingford. These donations were made possible by The Rock Church's food rescue program and Value Village in Totem Lake. From September 2017 to October 2017, I tutored Spanish sessions for middle and high school students at local libraries. The cost of the sessions was free with a donation of sleeping bags, backpacks (all types), tarps, tents, thermal clothing, hand and toes warmers, and fleece blankets to help the homeless have a more bearable winter in this cold and rainy city. From April 2017 to May 2017, I have volunteered at St. James Cathedral Hall by preparing dinner in the kitchen for about 180 folks with occasional visits to bring them soft drinks, candies, food, and donations. Between 2009 to 2016, I have also volunteered with several non-profit organizations such as Food Lifeline, Sleepless in Seattle, The Genesis Project, and Seattle Basket Brigade. On November 2015 to March 2016, I found a homeless organization to support, a temporary shelter located in Bellevue. Prepared meals once to two times per week and brought food to feed about 80 men. With the help of volunteers from meetup.com, we were able to provide a variety of foods. Also, we brought donations of clothing, backpacks, shoes, and toiletries for these folks. From November 2016 until March 2017, I supported the homeless folks in SODO "the jungle" (until they were relocated in March 2017) by bringing them donations from our friends and community (food, water, clothing, shoes, socks, toilet paper, and toiletries). From October 2016 to November 23, 2016, I was supporting Esther's Place (Hoff Foundation) in Everett by spending several hours with their drop in "clients", bringing bread, bagels, pastries, coffee, containers, utensils, clothing, snacks, coloring books, gel pens, and more. I am no longer supporting this foundation and their staff. You can check out their website at https://www.facebook.com/hofffoundation/?fref=ts so you could support the homeless women that this organization and their other programs are suppose to be doing for their "clients" to help them get out of homelessness. I am still waiting to receive their annual report in order to change the one star rating I gave on their Facebook page. From March 2016 to November 2016, I was supporting Shower to the People, a non-profit organization, by bringing supplies of shirts, towels, toiletries, socks, etc. to Frank Fargo and Jason Dunbar, serving lunch, drinks, snacks, and distributing donations to the homeless in the Lynnwood and Everett location every Wednesday evenings and Saturday afternoons. I am no longer supporting Shower to the People as two wonderful volunteers stepped up to help lead the donations in Everett and serving lunch every Saturday in Lynnwood. Happy to help other folks knowing that Shower to the People have continuous support from Cascade View church, my friends, volunteers, and their community. 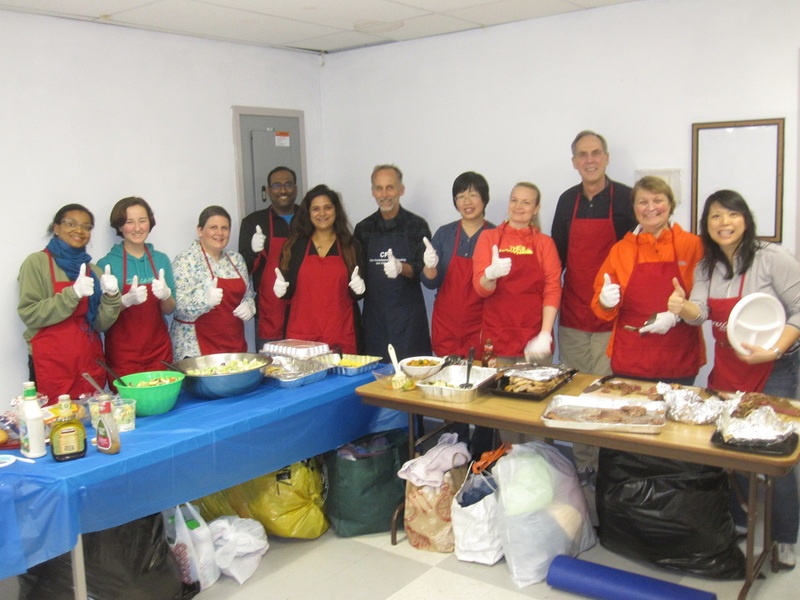 From October 2015 to May 2016, I have hosted and brought volunteers to feed weekly and sometimes by-weekly dinners the homeless men living in a temporary shelter in Bellevue called Congregation for the Homeless. The volunteers and I also brought winter clothing, underwear, socks, shoes, backpacks, sleeping bags, tents, tarps, blankets, etc. Attended Helping Hands Ministries silent auction and Hopelink's luncheon on September 2016. I have volunteered a weekend with the Seattle Blind Cafe in 2013 by coordinating in the kitchen and setting up the dinning room. Also volunteered with the United Way program as a reader for preschoolers from 2009 to 2011, volunteered with the Special Olympics in 2010 at their annual bowling event, volunteered at my children's school during their elementary school years, volunteered and helped to raise money during annual actions with Birthday Dreams, the Genesis project, and other non-profit organization such as The MoreLove project, and www.nphusa.org/. Homeless folks living in the streets from Seattle to Mt. Vernon, Monroe Community Senior Center, ECA (Eastside Community Aid) Thrift Shop, The Free Little Pantry in Rose Hill, Turkcha, Mary's Place in Northshore, Camp Second Chance, Birthday Dreams, Sophia's Way, Sleepless in Seattle, Days for Girls, and The MORELove Project. Homeless in Wallingford neighborhood, AOK Friends, St. James Cathedral Hall outreach Program, Lake WA United Methodist Church Safe Parking Program, Relay for Life, The Leukemia and Lymphoma Society, The Genesis Project, Ministerios Bethesda, Homeless outside the Union Gospel Mission in Seattle, Facing Homelessness, Helping Hands Ministries International, Lynwood's YWCA, Kirkland Hopelink, Treehouse, FoodLifeline in Shoreline, Redmond's YWCA, Special Olympics, Soles of Hope, The Forgotten Children's Fund, Eastside Camp Unity, United Way, Sibling House, Tent City, Friends of the Youth, Robert Smiley and his hand up project, Cocoon House, Basket Brigade, Cystic Fibrosis Foundation, Washed Mobile, and non local charities: http://www.trifc.org/ and Water Without Borders. Seattle Union Gospel Mission Search & Rescue program, Faith Food bank and Meals, FareStart, Faith Lutheran Church coordinator Roxana Boroujerdi in Everett, WA, Judy Hoffman from the Hoff Foundation and Esther's Place. Shower to the People in Lynnwood and Everett locations, Seattle's Union Gospel Mission Men's Shelter, Bellevue's Congregation for the Homeless Men's Shelter, The Seattle Blind Cafe, and Seattle's outdoor Operation Sack Lunch. Check out these organizations' websites that I support and have supported since November 2009 to the present. Thank you for helping me make a difference in our community and for making the lives of many folks who live in the streets or waiting for temporary housing a little more bearable. In 2019, I want to continue to support sister Elizabeth and her volunteers in feeding the homeless by bringing donations and extra food to make a difference in our community. I want to continue to support the Little Pantry in Rose Hill by bringing donations from The Rock Church's food rescue program. ​I would like to connect more businesses with charity in mind. I want to continue to inspire others to share their time in volunteering with my group or other non-profit organizations. Let's make this year another impact in our community! My Goal for 2018 was met! Thank you all for your support and generosity. In 2018, I want to inspire friends, family, businesses, and my community to directly support the homeless in Seattle by taking their donations to the homeless, see and feel the happiness of making a difference in their lives. Sometimes a simple act of kindness will make a huge difference in someone's life. I will continue to support reputable non-profit organizations and make a difference in our community. Let's make this year another impact in our community! My Goal for 2017 was met! Thank you all for your support and generosity. In 2017, I want to continue to inspire friends, family, businesses, and my community to support the homeless in Seattle. Host events to inspire folks to volunteer and to donate much needed items needed/requested by the homeless. Support reputable non-profit organizations and make a difference in our community. My Goal for 2016 was met! Thank you all for your support and generosity. In 2016, I want to inspire friends, family, businesses, and my community to support the homeless in Seattle. Host events to inspire folks to volunteer and to donate much needed items needed/requested by the homeless. Support reputable non-profit organizations and make a difference in our community. My Goal for 2015 was met! Thank you all for your support and generosity. To raise money for the purchase of sleeping bags, tents, backpacks, and tarps for the homeless in Seattle. Inspire friends, family, and my community to donate much needed items (Blankets, tents, backpacks, sleeping bags, tarps, socks, underwear, winter clothing, shoes, working boots, and toiletries). Support other non-profit charities such as Sleepless in Seattle, Seattle Baskets Brigade, Relay for Life, Children's Country Home, Cystic Fibrosis Foundation, Days for Girls International, and other local non-profit charities. ​Please check my events page from time to time to support my goal. Special thanks goes to The Community of Kirkland, Bothell Community, Kirkland Value Village, Amazing Friends and Neighbors for all your donations. It is greatly appreciated by me and by the homeless. Together, we make a difference in our community and in their lives. To donate online, go to Paypal.com, click on "Send" Select Friends/Family and enter AmigaDebbieCookies@gmail.com in the recipient box. Thank you for your support and caring hearts! My Goal for 2014 was met! Thank you all for your support and generosity. To provide tents, sleeping backs, and backpacks for the homeless and camp unity residents that need them the most. It was met! Thanks to friends and the community's donations and especially Sleepless in Seattle. Thank you from all the homeless recipients of your generosity and kind hearts! Volunteering with Sleepless in Seattle "The Big Give"
Feeding the folks at the Congregation for the Homeless with awesome volunteers! Thank you, Haiku Sushi and Seafood Buffet for donating your wonderful food to Lake WA United Methodist Church Safe Parking folks. 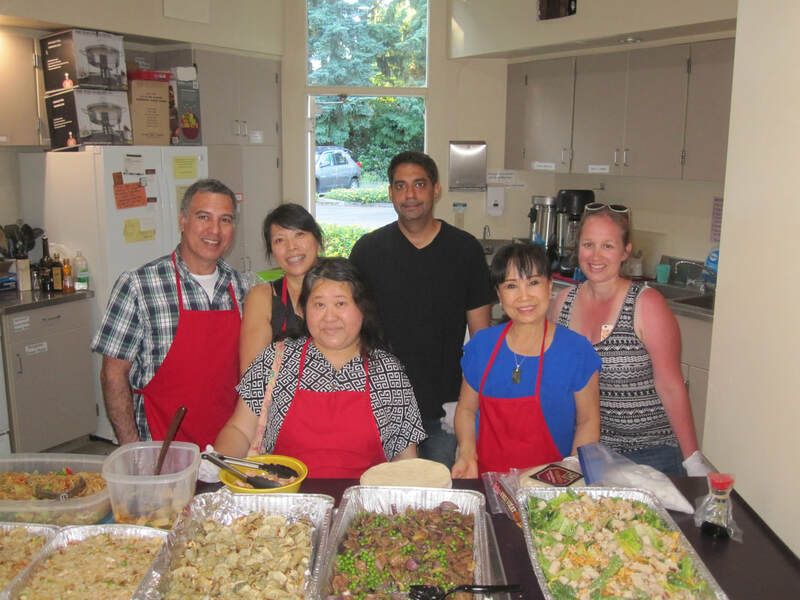 Thank you, awesome volunteers for coming out to serve this meal and Pho House for donating the Chicken Fried Rice.